This tutorial applies to 3DF Zephyr 2.0 and higher. 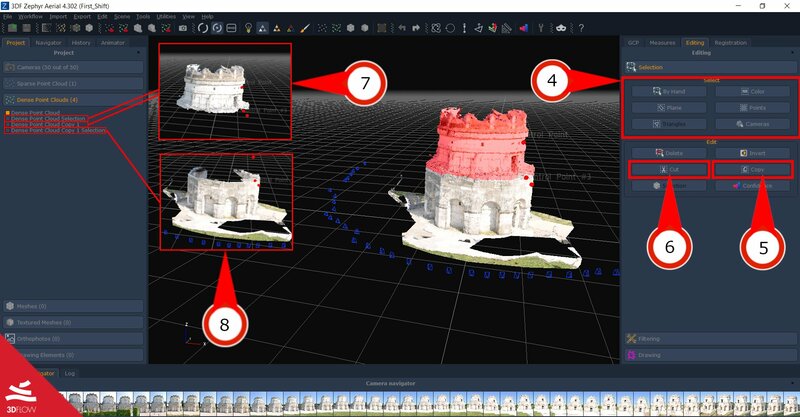 Having multiple copies of the same object (or parts of them) within the same workspace is very useful: you might want to do different reconstructions with different settings for different areas of the point cloud / meshes. 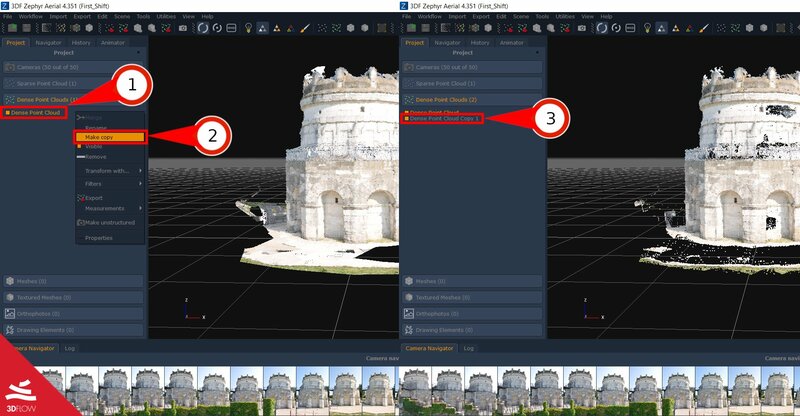 3DF Zephyr comes with very easy to use tools for this purpose, namely the “New Object by Cut” and “New Object by Copy” tools. From the “Project” tab, simply right click the object you wish to duplicate (1) (point cloud or mesh) and left click “Make Copy” (2). A new object with the same name (with “Copy 1” appended to its name) will appear in the workspace (3). You can now use this newly created object in an independent way: for example, you can clean this point cloud and then feed Zephyr the new copy as input point cloud when generating a mesh, so you can always go back in case you realized you removed too many points. Remember that these copies will increase the .zep filesize considerably. Select a subsection of your subject by using Select tools (4) as explained in Point cloud cleaning Tutorial. When finished, the select area will be highlighted in red (remember you can use the “Invert Selection” tool if you wish to do an inverse selection). At this point, all you have to do to cut or paste your workspace object is to click the “Copy” button (5) or the “Cut” Button (6). Experiment a bit with these tools since they can be a great aid in your workflow. The next tutorial will explain how to clean point clouds when needed. Click here to proceed to the next tutorial.